In my mind Thanksgiving is THE pie holiday. And I am the family pie baker going back to my teen years. That is why I was thrilled to pieces to see the release of Vegan Pie in the Sky from Da Capo Press just a few weeks ago. Vegan Pie in the Sky is the charming newest addition to the the Isa Chandra Moskowitz and Terry Hope Romero Vegan cookbook empire. They have collaboratively produced such gems as Veganomicon and Vegan Cookies Invade Your Cookie Jar. As always, they are aware of gluten-free needs and provide several options for gluten-free recipes. The explanation of ingredients and recipe instructions are written like a friend who is guiding you through the pie making process--something many think is daunting. As Moskowitz and Romero break down the steps for such classics as Blackberry Bramble and Maple Pecan Pies, you feel like the process, from crust to filling, is within your grasp. They also include some funky new favorites like Curried Macaroon Pie and Basil Peach Pie. All the recipes are dairy free and egg free. That being the case, you would think something like Blueberry Bliss Cheesecake, would be off limits---not for this pair! Cashews and silken tofu are employed to whip up an ersatz cheesy taste sensation. The recipes stretch the definition of pie to include cobblers, pandowdy's, tarts and a number of cheesecakes. The crust chapter is extensive, giving recipes for a no-butter, Buttery Double Crust, a flaky Vodka Crust, Olive Oil Double Crust and several gluten free options including a Gluten-Free Almond Crust. The Gingersnap Crust seemed very tempting to me, as I am perhaps the biggest fan of Trader Joe's Gluten Free Gingersnaps. A Buckwheat Double Crust is a refreshing healthy alternative in the pie world. I made the Chocolate Shortbread Tart Shell with Jules All-Purpose Gluten-Free Flour Blend, and found it came out beautifully. For those of you who have had it with oil based, synthetic tasting non-dairy whipped topping alternatives, Moskowitz and Romero offer several healthier choices employing almond or coconut milk. I look forward to trying more of the recipes, as well as future collaborations between these extremely creative authors. I use Josef Gluten Free Vanilla Cookies instead of graham crackers for pie crust, you can basically use any sort of plain, firm, gluten free cookie (i.e. not a soft chocolate chip cookie), I use the chocolate flavored cookies when making a chocolate mousse pie and it lends a very decadent flavor! 1. Preheat oven to 350 degrees and lightly spray a 9-inch pie plate with nonstick cooking spray. 2. In a mixing bowl, combine the graham crumbs and sugar. Drizzle in the oil or melted margarine. Use a spoon to blend the mixture thoroughly to moisten the crumbs, then drizzle in the soy milk and stir again to form a crumbly dough. 3. Pour the crumbs into the pie plate. Press crumbs into the sides of the plate first, then work your way down to the bottom. Bake for 8 to 10 minutes until firm. Let the crust cool before filling. Yield: Makes one 9- or 10-inch pie crust. 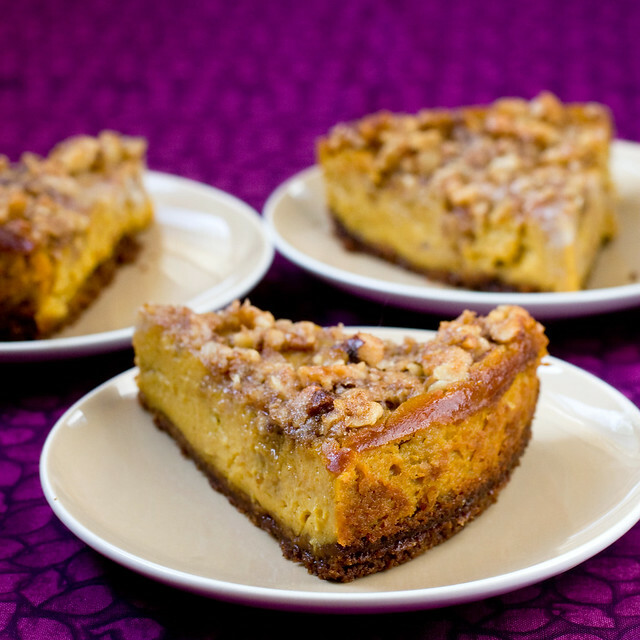 This is a non-dairy and egg-free "cheesecake"-- enjoy it with your Thanksgiving meal! 1. Make the topping first. In a mixing bowl, use a fork to mash together brown sugar, margarine and salt until crumbly, then fold in the chopped nuts and stir to coat with the mixture. Set aside until ready to use. 2. Preheat oven to 350 degrees and lightly spray the bottom and sides of a 9-inch springform pan with nonstick cooking spray. Prepare the crust and press it very firmly into the bottom of the pan. Bake for 10 minutes, and move the pan to a cooling rack, leaving the oven on for further baking in a bit. 3. Meanwhile, prepare the filling: Drain the cashews and blend with the banana, tofu, sugar, brown sugar, coconut oil, cornstarch, lemon juice, vanilla and orange extracts, and sea salt. Blend until the mixture is completely smooth and no bits of cashew remain. 4. Set aside 1/3 cup of batter. To the remaining batter, add the pumpkin purée, cinnamon, ginger and nutmeg and blend until smooth, then pour it onto the crust. Randomly spoon dollops of the reserved batter onto the cheesecake. Poke the end of a chopstick into a batter blob and gently swirl to create a marble pattern; repeat with the remaining plain dollops. 5. Bake the cheesecake for 45 to 50 minutes, removing the cheesecake halfway through the baking period to sprinkle on the topping. Return to oven to continue baking. Cheesecake will be done when the top is lightly puffed and the edges of the cake are golden. Remove it from the oven and let cool on a rack for 20 minutes, then transfer to the fridge to complete cooling, at least 3 hours or, even better, overnight. To serve, slice the cake using a thin, sharp knife dipped in cold water. Yield: One 9 1/2-inch cheesecake.